The problem just described is best approached by use of which quantitative method? A. Integrated autoregressive-moving average (ARIMA) modeling. B. Exponential smoothing, multiple parameters. Two basic costs are involved in queuing (waiting-line) models: (1) the cost of providing service (including facility costs and operating costs), and (2) the cost of idle resources waiting in line. The latter may be a direct cost if paid employees are waiting, or an opportunity cost in the caseof waiting customers. The objective of the queuing theory is to minimize the total cost of the system, including both service and waiting costs, for a given rate of arrivals. This minimization occurs at the point where the cost of waiting is balanced by the cost of providing service. Sales representatives for a manufacturing company are reimbursed for 100% of their cellular telephone bills. Cellular telephone costs vary significantly from representative to representative and from month to month, complicating the budgeting and forecasting processes. Management has requested that the internal auditors develop a method for controlling these costs. Which of the following would most appropriately be included in the scope of the consulting project? A. Control self-assessment involving sales representatives. B. Benchmarking with other cellular telephone users. C. Business process review of procurement and payables routines. D. Performance measurement and design of the budgeting and forecasting processes. A business process review (BPR) assesses the performance of administrative, financial, and other processes, such as those within the procurement and payables functions. BPR considers process effectiveness and efficiency, including the presence of appropriate controls, to mitigate business risk. It seeks to achieve improvements in such critical measures of performance as cost, quality, service, speed, and customer satisfaction. Because the objective is to control cellular phone costs, BPR is the appropriate tool. Linear programming is a mathematical technique for planning resource allocation that optimizes a given objective function that is subject to certain constraints. In this case, the maximum investment is constrained by a 70% limit on either investment choice. Which of the following will allow a manufacturer with limited resources to maximize profits? Linear programming is a mathematical technique for planning resource allocation that optimizes a given objective function subject to certain constraints. Thus, it maximizes a revenue or profit function or minimizes a cost function, subject to constraints. For example, constraints may be limited (scarce) resources or minimum/maximum levels of production, performance, etc. In business, linear programming is used for planning resource allocations. Managers are often faced with problems of selecting the most profitable or least costly way to use available resources. A. It is expensive to do the inspections at the end of the process. B. It is not possible to rework defective items. C. It is not 100% effective. D. It does not focus on improving the entire production process. The process used to produce the goods is not thoroughly reviewed and evaluated for efficiency and effectiveness. Preventing defects and increasing efficiency by improving the production process raises quality standards and decreases costs. If a manufacturer has established a limit on the number of defects that are tolerable in the final assembly of its product, which of the following quality control procedures should be employed? I.Inspect completed goods for compliance with established tolerances. II. Review sales returns for defects not detected during the final inspection process. III. Compare materials and machinery specifications with original product designs. Establish a quality circle that includes management and subordinates to discuss labor efficiency. Inspecting goods after completion of the production process and counting defective goods returned by customers are product quality procedures. They measure the level of product conformance with customer expectations. Verifying materials and machinery specifications are process quality procedures because they emphasize the inputs to the process and the process itself. A. Ensuring goods and services conform to the design specifications. C. Conforming with ISO-9000 specifications. D. Determining the appropriate timing of inspections. The intent of quality control is to ensure that goods and services conform to the design specifications. Whether the focus is on feedforward, feedback, or concurrent control, the emphasis is on ensuring product or service conformity. Management of a company is attempting to build a reputation as a world-class manufacturer of quality products. 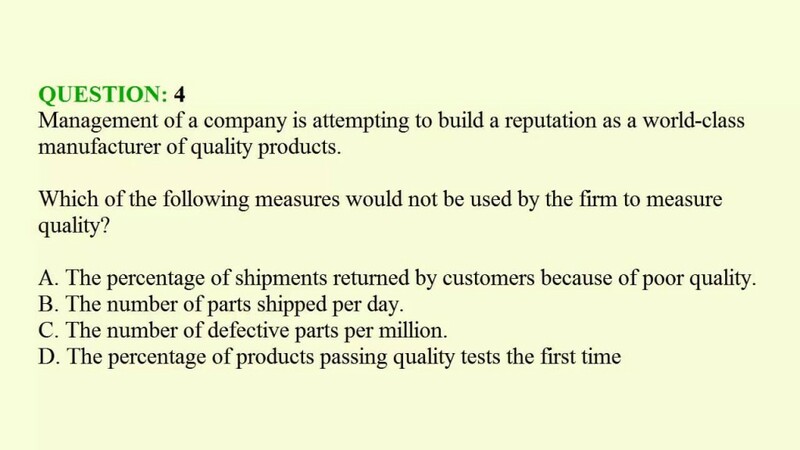 Which of the following measures would not be used by the firm to measure quality? A. The percentage of shipments returned by customers because of poor quality. B. The number of parts shipped per day. C. The number of defective parts per million. D. The percentage of products passing quality tests the first time. The number of parts shipped per day would most likely be used as a measure of the effectiveness and efficiency of shipping procedures, not the quality of the product. This measure does not consider how many of the parts are defective. Which of the following is not an appropriate measure of quality? Emphasizing lower input costs may result in more defective output, and higher input costs may or may not reflect the procurement of better raw materials. Financial measures are thus mostly unsuitable for measuring quality. Which of the following criteria would be most useful to a sales department manager in evaluating the performance of the manager’s customer-service group? A. The customer is always right. C. Employees should maintain a positive attitude when dealing with customers. D. All customer inquiries should be answered within 7 days of receipt. nature of the appraisal using thisstandard avoids the vagueness, subjectivity, and personal bias that may afflict other forms of personnelevaluations. A. The labor rate of comparably skilled employees at a major competitor’s plant. B. The average actual cost per pound of a specific product at the company’s most efficient plant. C. A US $50,000 limit on the cost of employee training programs at each of the company’s plants. D. The percentage of customer orders delivered on time at the company’s most efficient plant. Benchmarking is a continuous evaluation of the practices of the best organizations in their class and the adaptation of processes to reflect the best of these practices. It requires analysis and measurement of key outputs against those of the best organizations. This procedure also involves identifying the underlying key actions and causes that contribute to the performance difference. The percentage of orders delivered on time at the company’s most efficient plant is an example of an internal nonfinancial benchmark. No doubt, IIA-CIA-PART3 exam is worth challenging task but you should not feel hesitant against the confronting difficulties. Get a complete hold on IIA-CIA-PART3 exam syllabus through http://www.pass4itsure.com/IIA-CIA-Part3.html training and boost up your skills.What’s more,all the brain dumps are the latest.